Science is advancing rapidly. We are eradicating diseases, venturing further into space and discovering a growing zoo of subatomic particles. But cosmology – which is trying to understand the evolution of the entire universe using theories that work well to describe other systems – is struggling to answer many of its most fundamental questions. We still have no idea what the vast majority of the universe is made of. We struggle to understand how the Big Bang could suddenly arise from nothing or where the energy for "inflation", a very short period of rapid growth in the early universe, came from. But despite these gaps in knowledge, it is actually human nature – our tendency to interpret data to fit our beliefs – that is the biggest threat to modern cosmology. The picture of the cosmos we now have is one that is dominated by two components, dark matter and dark energy. These account for 95% of the energy content of the universe, yet we do not know what they are. This is an issue for cosmologists and indeed is rightly lauded as one of the most important problems in physics – explanations for the nature of dark energy range from proposals to scrap Einstein's theory of relativity, the addition of a new fundamental field of nature, or even that we may be seeing the effects of neighbouring parallel universes. But the dark energy problem is not the one that threatens to undermine cosmological experiments. In cognitive science, confirmation bias is the effect where people tend to unconsciously interpret information in a manner that leads to a selection of data that confirms their current beliefs. For cosmologists, this means the unconscious (or conscious) tuning of results such that the final cosmological interpretation tends to confirm what they already believe. This is particularly pernicious in cosmology because unlike laboratory-based experiments we cannot rerun our experiment many times to investigate statistical anomalies – we only have one universe. 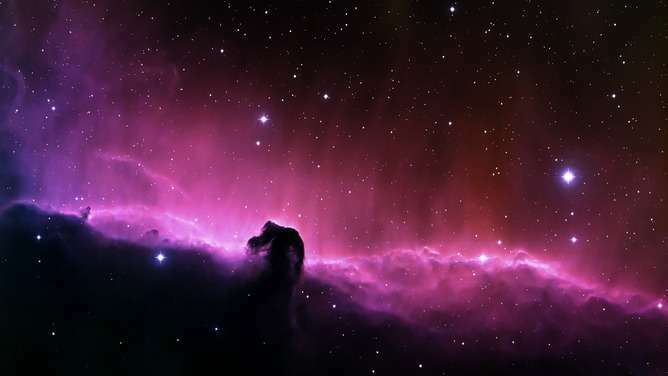 Nothing wrong with naming a nebula after what it looks like though, in this case a horse head. Unfortunately the problem is only going to get more difficult to avoid as experiments get better. Ask most cosmologists what they think dark energy will be, and you will grudgingly receive the answer that it is probably a vacuum energy. Ask most cosmologists if they think Einstein's theory is correct on cosmic scales, and you will grudgingly receive the answer that yes, it probably is correct. If these assertions turn out to be true, how can we convince the wider scientific community, and humanity, that any cosmological finding is not just the result of getting the answer we expected to get? There are three solutions to this problem that are equally important. Blind analysis is the most straightforward and obvious thing to do, and has also been the most talked about. In this case the aim is to create data sets that have randomised or fake signals in them, where the scientists doing the cosmological analysis are blind – meaning do not know if they are working on the true data or the fake one. Blind analysis, and control samples, are commonly and successfully used in biology for example. The problem in cosmology is that we have no control group, no control universe, just one, so any blind data has to be faked or randomised. Blind analysis has started to be used in cosmology, but it is not the end of the story. In addition to blind analysis there are two further approaches that are less widely practised, but no less important. The first is a systems engineering approach to experiment design. In this approach, each tiny aspect of an experiment has a list of demands or requirements and result-independent tests that it must pass before it is used. The idea is that if each sub-section of an analysis passes these tests then the entirety should produce unbiased results. The second is transparency – by publishing data and codes in an open way for anyone to download then there is no place to hide tuned parameters, and dodgy data. By using these three approaches – blinding, systems engineering and transparency – the next generation of cosmology experiments should be able to convince people that confirmation bias is not a factor in understanding the cosmos. Without them, by looking to the heavens, the most interesting thing we may find is ourselves. Do we need a new theory of gravity? Author has clearly fallen in with a crowd of pseudoscientists. Do not cite his work. "The astrophysical correspondence to the thermonuclear crisis has not yet come." It's a good thing real scientists are ignoring your stupidity. Thanks for the link! That's actually quite fascinating. I was just joking, but now that I see his former papers, I am intrigued even more. Dr. Kitching seems to be going through a (very healthy) personal crisis of some sort, for it takes quite a bit of bravery for an insider to ask the questions he raises. It requires an incredible amount of personal courage for a scientist to accept that there are still questions about the fundamentals in this domain. Most academics today despise such questions, due to the disruption they can cause to longstanding lines of investigation. "our tendency to interpret data to fit our beliefs"
That may be a little too severe as 'counter-intuitive' findings are often viewed as being more plausible or interesting than findings that simply agree with theory. But we can see the push for conformity with preconceived ideas and preferred world view in the beliefs of researchers and thinking in particular fields. Examples include Einstein's belief that a unifying theory would be based on geometry and his attempt to introduce another dimension to account for EM energy, an endeavour that failed. QM theorists expect a particle for everything including gravity and a particle model that includes everything including the Big Bang and other cosmological phenomena (Black Holes etc). The real problem is that we conceptualize from the framework of what we know, the way we define problems, the basis of our present understanding of reality. We cannot always think outside the framework of our own construction. We have no experience there. Perhaps we have not yet developed the mathematics to do that. "String Theorists would like a universe that is totally predictable and based on 'clean' math built on ponderable phenomena that is predictable all the way up, a determinist's paradise. That attempt failed miserably..."
Are they not bound by the Uncertainty Principle?
" We have catalogued and analysed cosmological parameter determinations and their error bars published between the years 1990 and 2010. Our study focuses on the number of measurements, their precision and their accuracy. The accuracy of past measurements is gauged by comparison with the WMAP7 results. " WMAP is straight garbage. If other data agrees with something that is basically fabricated , we have a bigger problem than I thought.
" the effects of neighbouring parallel universes." All you really need is one parallel universe connected thru a wormhole. The universe then becomes like a two-chambered heart. The universe doesn't just suddenly pop up out of some singularity from nowhere. Instead, a wormhole opens up from the parallel universe. It has to open up as pair production from some point and then spread out as pair production continues. Inflation comes from recycling antimatter at the beginning of time, that is when the wormhole opens. Antimatter flows from this universe back through the wormhole to the other chamber of the heart like blue blood from one chamber while normal matter flows like red blood. Blue blood is recycled into energy at the wormhole powering inflation. As inflation continues it takes longer for the blue blood antimatter coming through the wormhole in pair production to travel back through the wormhole and be recycled into the energy powering inflation. Expansion continues as long as the flow of antimatter back to the wormhole continues. Then, I presume, the flow reverses back to the alternate universe. Just started working on this one. Will have to do until a better theory comes along. At least one which seems more plausible IMOP. In fact, the statistical spread of the results was not consistent with what would be expected mathematically, which means cosmologists were in agreement with each other – but to a worrying degree. This meant that either results were being tuned somehow to reflect the status-quo, or that there may be some selection effect where only those papers that agreed with the status-quo were being accepted by journals. A circle jerk of confirmation bias, with a twist of censorship. Astrophysics in a nutshell. "Ask most cosmologists what they think dark energy will be, and you will grudgingly receive the answer that it is probably a vacuum energy"
I'm no expert but it would seem to be the vacuum pressure produced by pair production - maybe like the energy-momentum tensor of GR. Instead, a wormhole opens up from the parallel universe. It has to open up as pair production from some point and then spread out as pair production continues. At the current temperature of the universe most vacuum pressure comes from virtual pairs, but some events like lightening may provide enough energy for real pair production. 15 Books are at LULU. welcome Interaction. Cosmos Quest -promotes the knowledge base culture and integrates Space data and confirmatory Cosmological index. "Prominent bioengineers and cognitive psychotherapists are talking about the day when psychopathy can be treated through a combination of microsurgery and gene therapy of the brain." -Well couldnt you just amputate it?" asks one prominent psychopath. I like it when otto gives me all that attention. It is because I proved I am real, unlike the cowardly snipers. I am his fixation, the guy who beat him at his game of gotcha. I'll bet he went wild when he saw I really did those reports for NASA, really did work on rocket-powered aircraft, really was an original founding member of the group that put together the Electronic Battlefield and made it work. I wonder if these hiding snipers, cowering behind a pseudonym, have done anything of which they can be proud. Sniping isn't it. "A superficial view may lead us to think that we live in the golden age of science but the fact is that the present-day results of science are mostly mean, unimportant, or just technical applications of ideas conceived in the past." "There are several reasons to write about this topic. First of all, because I feel that things are not as they seem, and the apparent success of scientific research in our societies, announced with a lot of ballyhoo by the mass media, does not reflect the real state of things." "Creativity is blocked. It seems that the system gives the message that no ideas are needed. It seems the system, through its higher authorities, is saying that science only needs to work out the details. It is accepted that the basis of what is now known is correct, that present-day theories are more or less correct and only manpower is needed to sort out some parameters of minor importance. A Copernican revolution is totally unthinkable within the current system." "From my own experiences and those of others, I have observed that doors are opened and offers made to those who are servile and uncritical. A lot of work must be produced, but without any great aspiration towards saying something important. To obtain an academic position, to obtain tenure, to be successful in obtaining research funds, etc. it is necessary to conform." "The situation is that society is drowned in ideas and information without assimilating any of it, and only a few ideas, those selected by the establishment, will make some impact. We are in the era of mass media and propaganda. Only science which is given publicity in newspapers, TV, etc. will have any resonance in our society. But in order to control the mass media one needs money and social status. Only administrators and science politicians, who worry more about getting funds and prestige than about solving scientific problems, will be able to pass through this filter. People who dedicate great effort and time to thinking about new ideas in science are not paid enough attention. It is not the time of individual scientists. It is the time of big corporations, of megaprojects which know how to make maximum profit from state funds." "as pointed out by Luminet (2008), a consensus in the scientific community is transformed into orthodoxy and ends up becoming counter-revolutionary. This counter-revolution is constituted as a mechanism of self-defence created by the autonomous structure of knowledge in the building of theories. According to Iradier (2009), all disciplines or specialisations were constituted and directed by a process of removing questions. Once a theory is established by the system, its fundamentals are not investigated any further ... While a theory of science as an exploration without restrictions or prejudices and as a progressive approach to the truth is given publicity, research on the fundamentals of science is despised, and tricks are played against the people who have alternative ideas to these fundamentals. The first thing to be established becomes the last thing that is allowed to be revised." It seems the "crisis" is they haven't figured out dark matter/energy. I look forward to whomever figures it out and how that might enhance our prosperity. In the meantime, the lesser minds can continue to "confirm what they already believe" since that appears to be the best they can do. Heck, something they do might spark that mind that figures it out. all through history, and even now, there have been many instances of discussion about how to interpret aspects of nature, with various possible options without a clear answer, in which a group of scientists have opted to claim their position is the good or orthodox one while other positions are heresies." "the more controversial the topic, and the more of a challenge it is to established ideas, and the newer the approach, then the more difficult will be the problems in publishing it, and the higher the probability of its being rejected. Gillies (2008, ch. 2) argues that when a researcher makes an advance which is later seen as a key innovation and a major breakthrough, a peer review may very well judge it to be absurd and of no values. As noted by Van Flandern (1993, ch. 21), peer review in journals interferes with the objective examination of extraordinary ideas on their merits. Maddox (1993), who was editor of the journal Nature, has said that if Newton submitted his theory of gravity to a journal today, it would almost certainly be rejected as being too preposterous to believe. On the one hand, there is a failure to select novel ideas (Brezis, 2007; Horrobin, 1990). On the other hand, the refereeing process trends to conformity." "Scientists are educated nowadays in a habit of self-censorship. The system promotes self-repression in the spread of ideas, so most scientists, when writing a paper, think something like 'I think this and that, but I cannot say so in my paper because this will not pass the referee's control, so I will not say it'. This causes serious harm to creativity among people who dare to think new things." "... scientists have to choose between developing their own ideas freely or being constrained by subjects which allow academic success." "In the last two decades, I have observed, at least in my speciality, how the number of offers of postdoctoral positions with a free choice of research topic has been much reduced, substituted by positions working on a major project under the orders of senior 'priests'. This is, in my opinion, a huge obstacle for the creativity of young scientists, an unfortunate trend in the present-day bureacratized system ..."
"... Moreover, among people who are going to develop a topic freely, there is also a strong bias against all the applications which propose topics which are not suitable according to the mainstream of normal science. Certainly, this is the perfect way to uphold the power of tradition and to castrate new ideas. No revolution is possible within this system; only an outsider can do it." The public can fix this. Let's fund Dr. Pollack's Institute for Venture Science. Good thing we have physorg's star system. It's our last line of defense from having to listen to academic whistleblowers. No, it's a good way to rate pseudoscientific cranks. Martín López Corredoira has published 50 papers in astrophysics and cosmology, for which he is typically the lead author. .....and must be the reason you're not doin' so well. What is lost through the mainstream's dismissal of whistleblowers will be gained by outsiders, who will build a new system for academic review. There's a better way to handle academic controversies, and the risk that is taken through the decision to turn the other way is that those outsiders will eventually be in charge of this new system. Keep it up, but don't be surprised by what is coming. Re: "The review does not argue in favor of any alternative theory, but to claim that cosmology is still a very young science and should leave the door wide open to other positions." "Although most of my papers are quite conventional for a professional astrophysicist, there are many of them (maybe 10-20% of them) with a substantial degree of challenge to established ideas. This brought me some fame among my colleagues for holding unorthodox views. Indeed, most of my works are quite orthodox. And indeed, although I have expressed several times my sceptisicm about some orthodox ideas, in particular about the Big Bang hypothesis in cosmology, I am not an anti-Big Bang cosmologist, as many people have thought. I do not defend any alternative theory. Scepticism, doubting a dogma, does not mean a new dogma should be defended to substitute for the first one ..."
Be aware that even within the Thunderbolts Group, there is not perfect uniformity on the fundamentals or mythological interpretation. There remain some disagreements between Wal Thornhill, Don Scott and Bob Johnson on the fundamental physics for stars as well as some larger scale phenomena. As this article by Kitching points out, the questions about perfect consensus seem related to the mainstream of astrophysics and cosmology, and he rightly points out that it is an anomaly. So, if your intent here is to drive a wedge between Martín López Corredoira and the EU adherents, be aware that we don't share the same top-down mentality of the mainstream, and we don't consider this a fault. The right to dissent is respected as a fundamental right. Of course, the first thing that needs to change is the current penchant for labelling anyone who disagrees with the establishment view as a crackpot. Most people who label me (and others like me who don't believe in Dark Matter, Dark Energy, Gravity Waves, etc., etc.,) have never bothered reading and understanding my theories, some even have the brazen-nosed effrontery to actually admit to never reading my books but have negatively reviewed them! Science? Don't talk to me about science.....(the answer is 42 by the way, if you haven't read Douglas Adams). This misunderstanding has its root in belief, that the red shift is manifestation of expanding universe - whereas it's product of light scattering with quantum fluctuations of vacuum instead. That is for you to prove. Re: "Of course, the first thing that needs to change is the current penchant for labelling anyone who disagrees with the establishment view as a crackpot." The formation and evolution of galaxies can only be explained in terms of gravitation in the cold dark matter theory of an expanding Universe. I'd don't think you need any dark matter to explain the formation of galaxies, only entropic gravity due to big bang turbulence. And making life unnecessarily difficult, which is the sad part. I'd say though, if you believe in a higher intelligence, nature really loves outsmarting the physicists. Of course if you believe we are the highest form of intelligence, that would really make me wonder. Do you really think there is ANY physicist who does not know this? which is counter to the Einstein assumption that it was supposed to be spherical. No it is not. That property is never a requirement for relativity. Also, an incoherent superposition of dipoles with arbitrary orientation radiates spherically. Thus, Einstein's theory is incorrect, which casts most of cosmological models into doubt. Wow you are lazy. You are not even a crackpot. Start cracking. For those who may doubt these "facts", I suggest that you plot the field waves of the radiating dipole antenna and see for yourself. If you need help, I am here to aid you. Why don't you study physics first and then offer your help. Without proof no one cares what you think. It's tough out here. nature really loves outsmarting the physicists. And it does not even care about the crackpots. You're not doing so well yourself if I can help it. Easy there. Without proof no one cares what you think. It's tough out here. Why make it tougher than necessary? Proof requires assumptions. I'll settle for plausibility until someone comes up with a better explanation. Lighten up. whereas it's product of light scattering with quantum fluctuations of vacuum instead. You KNOW this doesn't work. Even the guzy who came up with this theory later admitted that it doesn't work. If it were scattering we'd see blurring increase the farther away something is. That blurring is not observed. I really don't get why some people still cling to the tired light idea even though it fails all observational tests. @my2cts, is Martín López Corredoira a crackpot? I think what he says makes a lot of sense. Did he advance an obviously non-viable theory and then refuse to even back it up like so many do here? Re: "Did he advance an obviously non-viable theory and then refuse to even back it up like so many do here?" Okay, are you aware that Dr. Gerald Pollack is pointing to this particular book as the basis for his design for the Institute for Venture Science? The IVS is a proposal for a new system of peer review to run alongside the existing one. They are seeking an endowment of $1 billion. (1) The IVS invites groundbreaking proposals. Applications must address big issues. (2) These ideas go through a vetting process to weed out flaky proposals. (3) With what's left, the IVS asks for a scathing critique from the field's leaders, and establishes a debate between the two sides. (4) Evaluators from outside the field listen to the debate for how well the applicants can defend themselves. If necessary, questions are asked and the option for an oral debate is available. (5) A judgment is made as to how well they did and how important their subject is. The challenge paradigm need not be proven better than the prevailing one, only of reasonably high potential to be proved better. (6) The IVS funds selected proposals liberally in order to guarantee that money will be there for years. (7) Multiple groups using different techniques are funded to pursue the same theme, in order to establish a critical mass. Typically, 10. (8) If the challenge really has the goods, in 2-4 years it'll be obvious that the evidence for this is convincing. The point is to create a path for challenges to fundamental science to be elaborated to a state where they actually stand a chance of unseating the textbook theory. I like it, but "unseating the theory" does not equal acceptance from the Old Guard. You will have to wait until they retire or die, like with the developments of General Relativity and Quantum Dynamics. Einstein got to be on both ends of that phenomenon. It may not be the complete solution, but it is definitely the next step towards a resolution, to my eye. They also understand that something more is needed with regards to education and a web interface to the public. That is the part which I am intensely interested in, as I feel that I know how to solve both of those problems with one system. What people need to understand is that we will not arrive at a complete solution in one step. The only way forward is to take the steps that we know for sure are needed, and then observe what transpires sufficient to understand what the next steps are. Holding back on acting just because it might not be a complete solution would be a huge mistake, because you have to understand that any step towards reform of the grant system would send shock waves throughout all of academia. There would be an immediate realization that this is a better system and that it will lead to innovations, and they would predictably copy it. I used to publish on facebook but now they will only let me post and page admins are notified. Must be shock waves coming from somewhere. There's another blog, I think it's Physicsworld, where my posts vanish in the blink of an eye. Actually that would be Space.com. @Seeker2, it seems that the message that is being conveyed is that you will ignore academic whistleblowers, ridicule anybody who quotes them and dismiss attempts by successful researchers to reform their own practice. Dr. Pollack has already advised the National Science Foundation on how to fix these problems, AND THE FUNDING AGENCIES HAVE ALREADY ACKNOWLEDGED THAT THESE PROBLEMS EXIST, as they've already attempted to implement Dr. Pollack's suggestions. He was, after all, the keynote speaker at a talk for the NIH called "Fostering Innovation Workshop" on this very subject. Fast-forward to 1 hr 16 mins at http://videocast....;bhcp=1. You guys try so hard to dismiss everybody who disagrees with you that you do not even understand when change is already happening. Thanks. Working on it. I have been working on an invention idea that I believe could save thousands of lives on slick roads and runways. Having trouble finding the engineering talent to develop the drawings. Maybe I can find something here. I like it when george the psychopath pretends hes something hes not. Like knowledgeable on physics. Tell us how an H2-initiated fission event in dirty molten Pu at the bottom of a fukushima containment vessel could throw debris 130km even though thermonuclear weapons cant throw debris more than a few km? Was this perhaps a relativistic phenomenon of some sort george? Pu soup in 2 places at once? Your thinking sure is spooky action. Re: "Thanks. Working on it. I have been working on an invention idea that I believe could save thousands of lives on slick roads and runways. Having trouble finding the engineering talent to develop the drawings. Maybe I can find something here." So, this time, if I am understanding you correctly, what you appear to be saying is that all ideas should go through the academic peer review system -- apparently including ideas which point to the failure of that system -- and that an article discussing a crisis in cosmological theory is apparently not the correct space to discuss ways to improve the peer review process. I'd say you were leading the witness. Re: "I'd say you were leading the witness." "Compare this review system with that of a court. The 'court' is set up here to adjudicate the fate of a grant application. A plaintiff makes the case. The case is against the defendant (establishment) – who then proceeds to act as judge. The party making judgment is the very party who stands to lose most if the application prevails." We should think more deeply than shallow references to a court system; we should actually ask what it is that makes a court system effective, and apply those principles to scientific review. Incarceration seems to be effective. So how many years should we give the climate deniers? Maybe parole if they repent? Call out the thought police? Re: "So how many years should we give the climate deniers?" The concept of climate "denial" rests upon the assumption that challenges to textbook theory are rare. But, that conflates the refusal to acknowledge their existence with a complete lack of existence. And then I entered into cell biology, and I saw the same problem. And then I entered into muscle contraction, and I saw the same problem -- a theory that has been around since 1954, believed by everybody, but the evidence is so clearly against it, the people who have evidence against have no ability to make any inroads against the establishment." Oh then there's the death sentence. Reserve that one for the Big Bang deniers? "So, I came to realize that this is true in numerous fields ... This is endemic. It's just all over science." And then there are the GR deniers. Especially pernicious in my view. And the tired light devotees. @Seeker2, you seem to live a very simple intellectual life, in that you equate textbook theory with truth. Have you ever deviated from the mainstream? Have you ever deviated from the mainstream? Apparently. Especially with time reversal. Consistently evasive on anything which does not fit your simple narrative. Yes I do prefer to keep it simple.